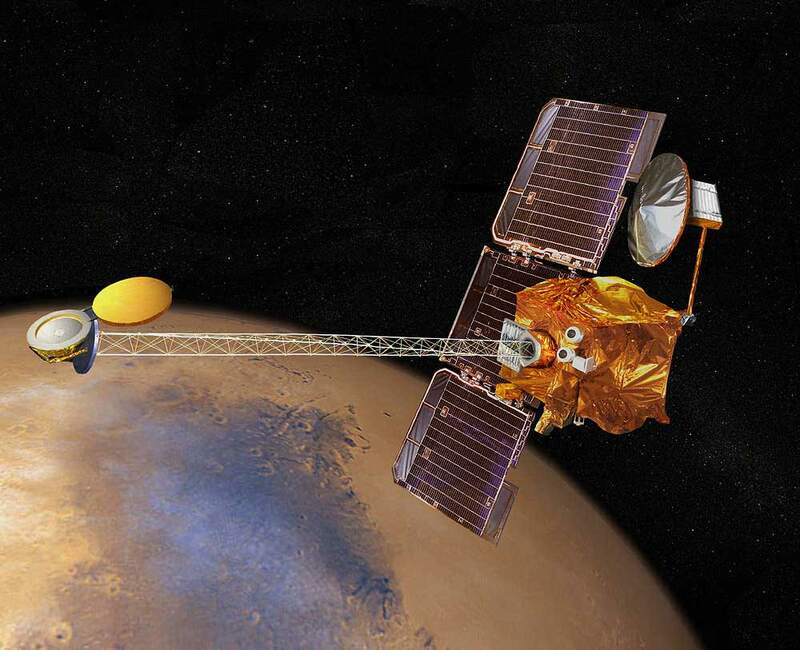 The Mars Odyssey orbiter went into safe mode on Saturday, November 28th because of a glitch in the “memory error external bus” of the satellite. Odyssey will remain in safe mode at least until the end of the week, effectively slowing down communication with the two rovers, Spirit and Opportunity. Odyssey is still operating at normal temperatures and communicating with the control team back on Earth. It stayed in safe mode over the weekend. After a full reboot today, the craft is on the mend and expected to be fully operational later this week. “This event is a type we have seen before, so we have a known and tested path to resuming normal operations,” said Odyssey Project Manager Philip Varghese of NASA’s Jet Propulsion Laboratory in a press release. Odyssey has been orbiting Mars since January 2002, mapping the surface and taking global measurements of the planet. Odyssey has also been the link to the Earth for the two rovers since 2004, acting as a communications relay that speeds up the transference of signals between the robots and the control team. Though Spirit and Oppy have their own antennae for communication, Odyssey can communicate with the Earth at 10 times the speed and with a fraction of the energy usage. This glitch is really nothing new for the satellite – it’s much like having to reboot your laptop when it freezes up. The Mars Reconnaisance Orbiter would be the obvious backup for Odyssey, but the MRO has been in safe mode since August 26th. The MRO rebooted itself four times in 2009, and after the last reboot the spacecraft has stayed in safe mode to prevent any catastrophic damage to its memory. NASA had planned to uplink files to the MRO to restore it sometime this week, but the uplink and recalibration of the satellite would take over a week, meaning that if Odyssey isn’t back up by the end of the week Spirit and Opportunity are on their own for a little while longer. Odyssey is a key player in the efforts to free the Spirit rover, which has been stuck in a sand trap since May 1st of this year but is making progress. Because of a wheel stall problem that the control team thinks may be internal, an extrication attempt made on November 28th wasn’t successful. The Spirit control team hadn’t planned on making any more maneuvers to free the rover this week, as they are still analyzing the recent attempts to plan for future efforts at freeing its wheel. Hopefully, by the end of next week we’ll be seeing two fully-functioning orbiters and a freewheelin’ Spirit.